The 20/20 Scenario: After a year of recession, what's next for ad revenues? Last summer, I wrote a piece for the print edition of Press Gazette outlining the scale of the carnage that would be caused by two successive years of 20% declines in ad revenues during 2008 and 2009. At the time, regional newspaper groups were already delivering year-on-year declines of 20%. The nationals, I reckoned, would surely follow. To illustrate the scale of the challenge, I calculated what Johnston Press and Associated Newspapers would need to do to maintain their pre-recession profit margins under such circumstances. They would need to cut deep. At Johnston Press, cuts of £115m — amounting to around one-third of the company’s cost base — would be required across 2008-2009. At Associated, cuts of £150m would be needed. Partly because these numbers were so huge, The 20/20 Scenario seemed freakishly alarmist. At the time, projections for ad revenues knocking around the market — many of them generated by ad agencies — still looked relatively rosy. In May 2008, for example, WPP-owned Group M predicted that UK ad markets would decline by just 3% in 2008 and by 5.6% during 2009. Tony Loynes, the then editor-in-chief of Press Gazette, wasn’t best pleased with my copy. He was keen on pinpointing a few reasons why the newspaper business might emerge from recession in half-decent shape. The copy left him with a bit of a dilemma. ‘We can’t just tell the industry that it’s fucked,’he said. Well, the notion of two successive years of 20% declines in ad revenues is no longer looking exotic. 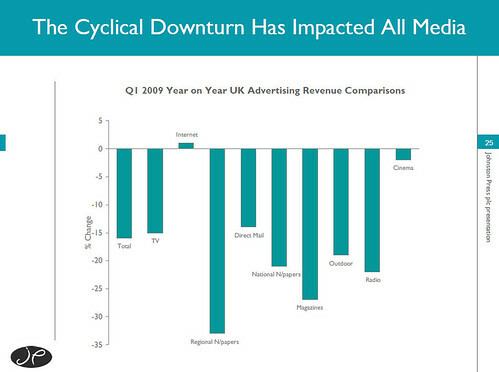 Last week, John Fry, the chief executive of Johnston Press, used the Advertising Association data I’ve reproduced above to illustrate what has happened to ad spend since the onset of the downturn in early 2008. The regional press has pretty much managed to cram two years’ worth of 20% declines into a single year. So far as I can tell, Johnston Press has cut £63m out of its cost base since the start of 2008. That’s not quite £115m. But part of the pain has been expressed in declining operating margins, which have nearly halved. And make no mistake: there are more cuts to come, not least because of the penal terms on which Johnston Press refinanced its debt this week. Ad revenue declines in national media have steadily deepened. The outliers have been run ragged. Channel Five recently reported a 27% YOY decline in ad revenues during the six months to June. 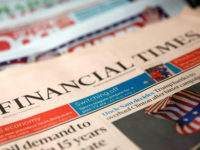 Independent News & Media reports that ad revenues at the London-based unit that contains the Independent and the Belfast Telegraph fell by 35% YOY during the first half. 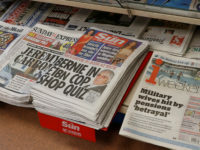 Another way of skinning the same cat: during the first six months of this year, Johnston Press generated £67m less in ad revenues than it did during the corresponding period in early 2008. At INM, the Independent, the Independent On Sunday and the Belfast Telegraph have lost perhaps £30m of ad revenue during the past year. Hence the hopeful talk of ‘easier comparatives”, ‘stabilization’and ‘bumping along the bottom”. But note O’Reilly’s conditional. We’ve ‘probably’seen the worst. Aside from the odd glimmer provided by economic data, the potential upside feels eerily limited. This occurred to me last week, reading the financials turned in by the global drinks group Diageo. The company reported a healthy increase in net sales, from £8bn last year to £9.3 this year. Notably, however, global marketing spend fell by 9%, because of ‘media deflation”. Even in a recovery, advertisers won’t allow media owners to claw back concessions like this in a hurry. The potential for downside? It feels plentiful. Households seem to be unwinding debts rather than consuming. As the damage to the real economy over the past year feeds back into the financial system, the banks are being hit by a rapidly rising tide of defaults on corporate loans. This explains why business lending is so anaemic. Although the figures are notoriously volatile, the apparent collapse in business investment is worrying. Unemployment is still rising. We’ve still got deep public sector spending cuts to come, as well as the withdrawal of VAT cuts and quantative easing. In the short term, a renewed stock market collapse is the most likely catalyst for a further loss of confidence in ad markets. 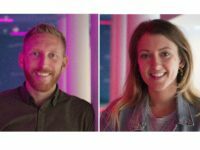 As chief executives are pummelled by investors in the wake of a crash, marketers swiftly feel the heat emanating from above. Budgets get slashed rapidly. After a huge bounce from February’s lows, the Footsie feels uncomfortably like a sleep-deprived supermodel clattering along the catwalk in 9 inch heels. As Larry Elliott pointed out in the Guardian on Monday, September is traditionally an ‘accident-prone’month. October, too. Setting out The 20/20 Scenario last year, I felt like one of those old guys who used to pace up and down Oxford Street with a sandwich board proclaiming that the end is nigh. This year, I feel like first cousin to the Grim Reaper. Let’s hope the markets avoid an accident this autumn.